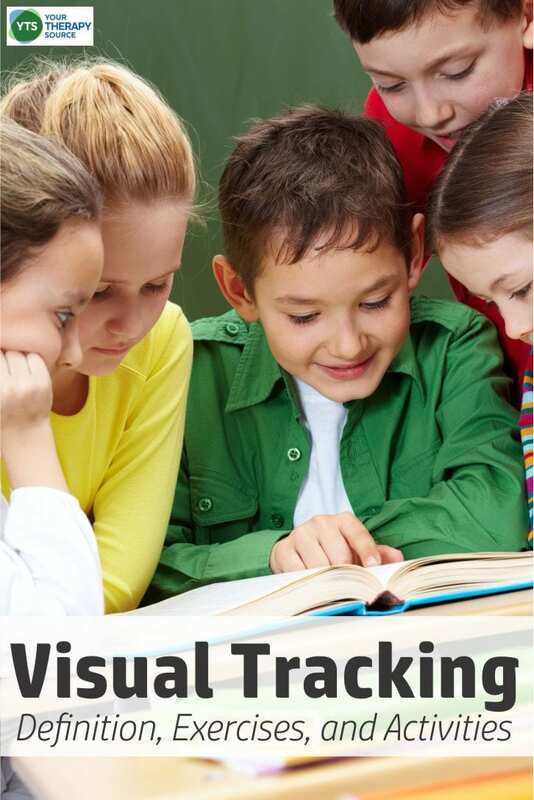 A key visual perceptual skill for children to develop is visual tracking. These skills develop at birth and continue to develop and advance as children get older. Teachers, pediatric occupational and physical therapists and parents should be educated on the importance of the development of all visual perceptual skills in children. Visual tracking is the ability to control the eye movements using the oculomotor system (vision and eye muscles working together). There are two types of tracking: maintaining your focus on a moving object and switching your focus between two objects. Newborns begin to develop this skill by having alert periods of time where babies examine people and things around them. This ability progresses to where babies can visual follow or track people or objects close by. At first, babies may move their head and eyes to visually track someone or objects, but then this skill advances and babies can move their eyes without moving their head to visually track. Why is Visual Tracking Important? We need to track and follow objects moving in space and to follow stationary objects in order to interact with our environment. As children get older, this skill is a key component to fluid reading, coordination tasks, body awareness, and postural control. Visual tracking allows you to know what you are looking at and where to look. For reading, your eyes move along written text by fixating on a word and then making a small jump to the next word. If you do not have smooth eye tracking, then you may: skip words, skip lines, move your head too much when reading, use your finger to keep your place when reading, have trouble comprehending what you read or be unable to catch, throw, hit or kick a ball with accuracy. What are Some Modifications to Help Children Visually Track? Children need adequate skills to visually track to function properly in school and at home. If you have concerns about your child’s visual skills, be sure to start out by having your child undergo a thorough vision examination by an optometrist or an ophthalmologist (medical doctor). use highlighters to help maintain place in text. using a larger ball or balloon to practice catching. play catch with a a brightly colored ball. toss balls with a slower speed. play any games that involve catching or hitting a ball. Practice throwing a ball at a target. play flashlight tracking games – go into a dark room and follow the flashlight on the wall. Hang letters or words on the wall. See if the child can find them using the flashlight in a dark room. complete letter finds, word finds or hidden pictures puzzles to visually scan and find objects on a page. For younger children, Find and Follow is fun! For older children, check out One of a Kind. go on letter or work scavenger hunts. progress to having your child visually track objects while the child is also moving. For example, look for objects while you are moving in a car or on a swing. Try throwing a ball to the child while they are running. Try throwing your child a ball to catch when they go down a slide. play tag – the child has to run while visually tracking moving objects. Try balloon kickboxing. This fun activity encourages bilateral coordination, timing, eye-hand coordination, visual tracking skills, and upper extremity muscle strengthening. The key to this activity is teaching the child to hit each balloon or ball with the right hand and left in a rhythmic, controlled pattern. Have fun with it! 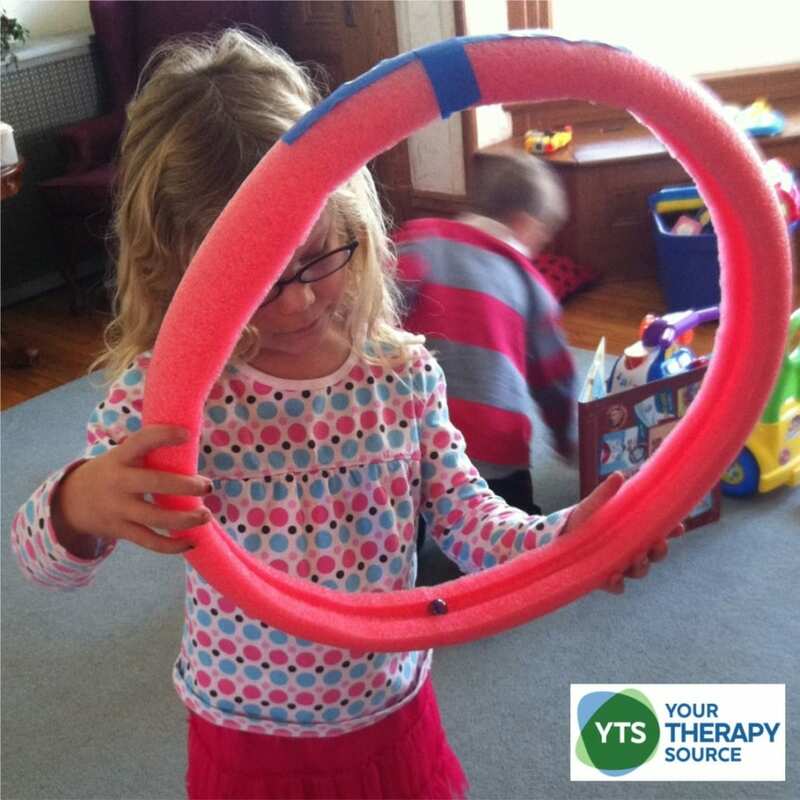 Try a pool noodle tracking activity – All you need is a pool noodle, a marble, and some tape. Try to make the marble go around the circle track without it falling out. See how many times you can make the marble go around the track. Our record was 32 times! Looking for a quick, no prep visual tracking activity? 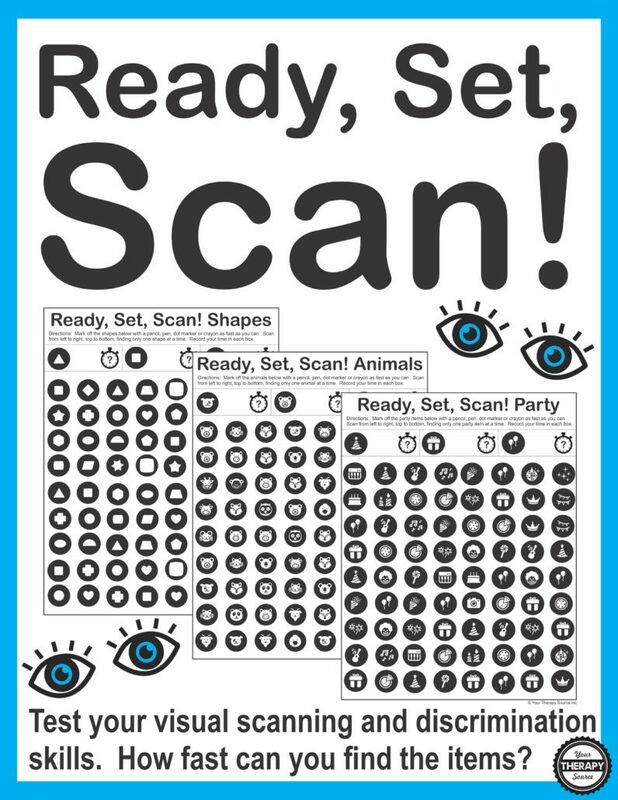 Check out Ready, Set, Scan. 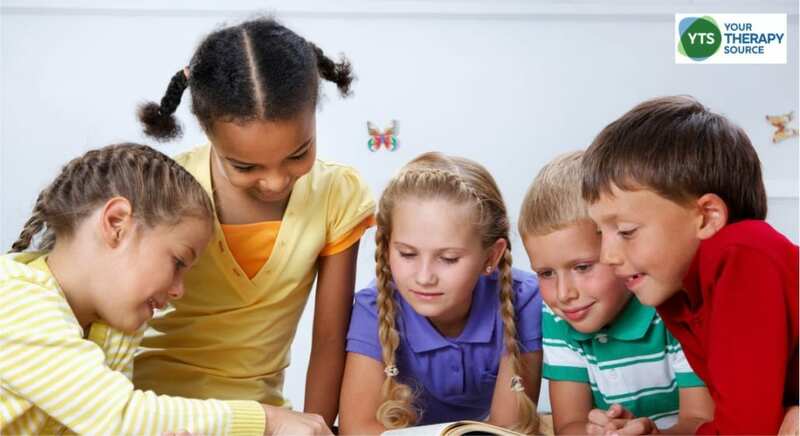 This digital download includes 12 visual scanning and discrimination activities. How fast can you scan, find and mark each item? There are 12 challenges in all with different themes including: shapes, animals, fruit, party, travel and babies. Just print and start the search. Follow the directions: start a timer, scan for one object at a time, mark each object and stop the timer. Record your time in the box provided. Dot markers work great for marking the item. Use a different color dot marker for each item. FIND OUT MORE.